I was in New York on business recently, and early one morning I took a look out of my hotel window to check on the weather. Snow had been predicted and I wanted to see if it was snowing yet. 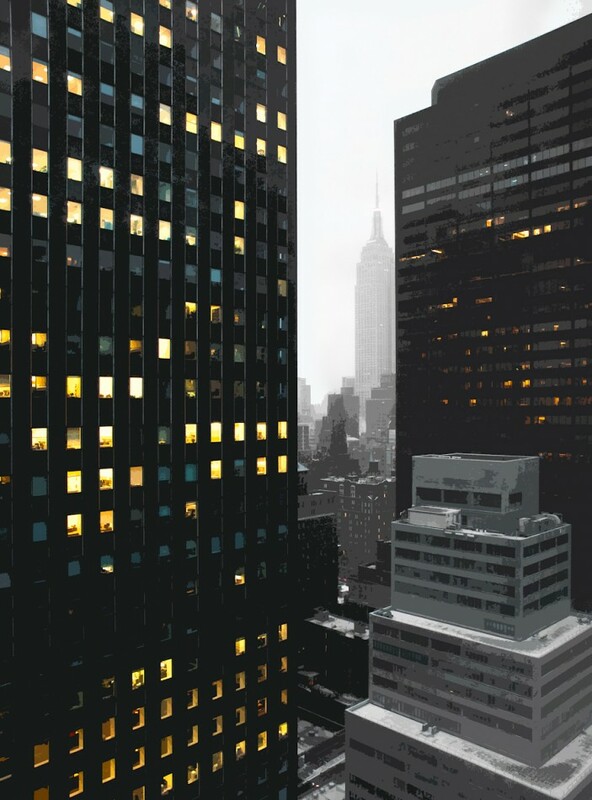 When I looked out, I was captivated by the color and geometry of the skyscrapers, particularly the way the windows were lit. Since it was early, only a handful of lights were on and it created an interesting pattern. As I looked further, I could see the Empire State Building in the haze, a haze created by a light snowfall. I really liked the combination of the strong, modern geometric shapes in the foreground combined with the older architecture of the Empire State Building fading into the background. The image has had some simple processing done to it. I used the ‘cutout’ filter in Photoshop to make the image less about reality and more about shape and color. I then used a mask to remove the cutout effect from the Empire State Building because I wanted to see all the detail that I could. The image looks like a monochrome shot with selective color, but this is what things looked like in the early morning light. This image can be purchased as a framed/unframed print, or as a poster. Jim–this is a very cool photo esp. with the Empire State Bldg. in the “slot”. I liked your Chelsea Clocktower photo too. They sky is fab. !